Bosch Jigsaws- Forever the Boss!! Bosch is the personification of quality guaranteed. If you are looking for jigsaws that specifically suit your needs, then your search ends here as Bosch manufacturers jigsaws for people ranging from amateurs to professional carpenters. Bosch jigsaws features multiple speed settings, orbital cutting actions and many bosch blade accessories to choose from. Jigsaws are instruments that are used to cut or carve patterns & designs on wood or any other material. Innovative features, compact size, smoothness & maximum efficiency are all common aspects of Bosch Jigsaws. Each tool has been assembled to render stability & strength at its zenith. They have 2 series the T series & the 15 series. Since jigsaws are mainly subjected to heavy duty work it is important for them to be stable & durable, Bosch renders exactly that. With bodies built in metal & heavy duty blades, These jigsaws are made to cut the toughest material with at most precision. The weight of Bosch jigsaws T series have been a very pleasing aspect since, it increases accuracy thus holding the machine in place even while cutting materials of varying thickness. Since the motor is the most integral part of the jigsaw, Bosch ensures that the power of the jigsaws is unmatchable, as the speed & consistency of the blade never drops irrespective of the hardness of the cutting surface. Surprisingly minimal vibrations ensure proper grip & cutting pattern. These are popularly known for making intricate & fine curves. The blades are designed to offer maximum versatility of movement. Unlike in other manufacturers, the blades of all These jigsaws can be replaced in an amazingly & straight & simple manner, not requiring any subsidiary tools. It is characterized by a "snap out & pop in" mechanism discarding the "twist round & round" one. Another striking characteristic of the 15 series is the extremely minimal heat build up even when it is used for long hours at high speeds. Some models come with an inbuilt laser light which is extremely helpful when cutting straight lines. Also, the built-in work lights area a sure welcome in dimly lit working conditions. Since the current consumption is a situational requirement, Bosch produces variable amp jigsaws. The guide books given along with the product convey usage & handling instructions in a simple, appropriate & uncomplicated manner making even first time user feel comfortable & confident about handling the tool. 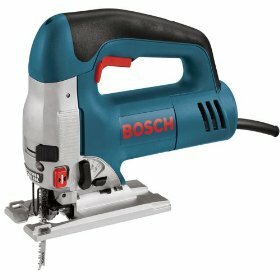 Jigsaws from Bosch may likely seem to be more pricy compared to the other brands in the market. This may be attributed to the quality difference that Bosch jigsaws claim to offer. In some models the "click-in" base become loose due to frequent usage, which may need some constant "pushing into place". Though the weights of these jigsaws are an advantage some buyers opine that the weight adds on to the inconvenience during transportation & for general handling. The box which comes along with the Bosch tool seems to be of a very compromising quality, though it is not a matter of serious concern. It is no match to store such a solid instrument in properly protected conditions. Return From Bosch Jigsaws Page to Home - Finishcarpentryhelp.com.